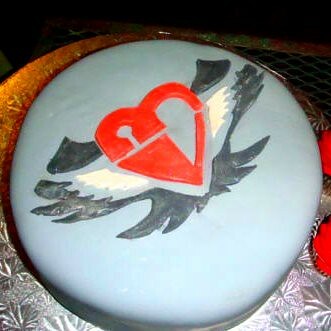 This Saturday marked the final performance of my boyfriend P.J.’s band, Beta Valentine… To celebrate the last performance together at the Club De Ville in Austin, I made a Beta Valentine-themed cake to take to the show. At P.J.’s request, I made a rich lemon cake with cream cheese filling… It’s iced in vanilla fondant (gray for the boys…) and the band logo is also vanilla fondant. I have to give credit to P.J. for the logo - he painstakingly cut out the logo elements while we were scrambling to finish things up pre-show. :) Also, the beautiful cupcakes were made by another member of the Beta Valentine family - Chris’ wife Jennifer. Yum! Wow! What a busy 24 hours! I did three cakes for Saturday - no small feat with a day job. Cake #1 was for my sweet little neighbor, a lovely little girl having her third birthday party. 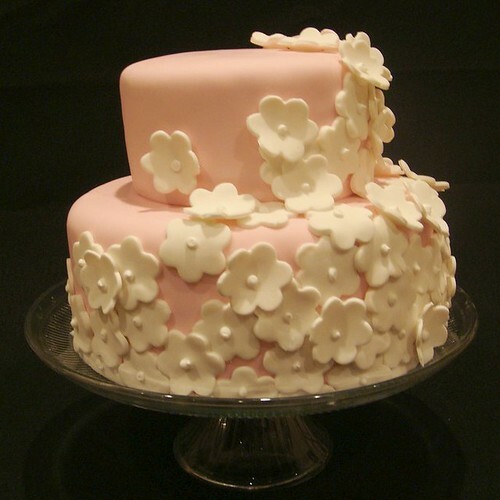 She requested a white cake with pink icing… see below for the results! It’s a sour cream white cake with pink buttercream filling and pink fondant. 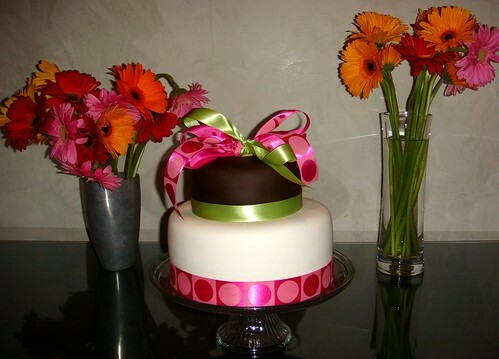 The little white flowers are fondant with a touch of royal icing. Cake #3 was a quick little cake for my lovely neighbor Courtney… a fun little buttercream. It’s a sour cream chocolate cake with peanut butter and Reese’s Cup filling, iced with chocolate and vanilla buttercream. 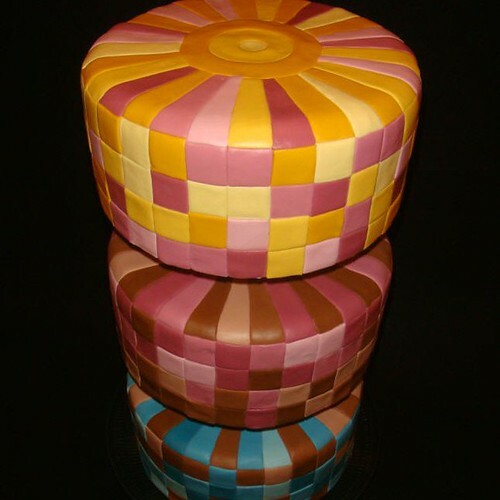 Now I’m getting prepped for the upcoming Capitol Confectioners Club competition at the end of the month… should be fun! This was another great baby shower project… this one for a friend of a friend. 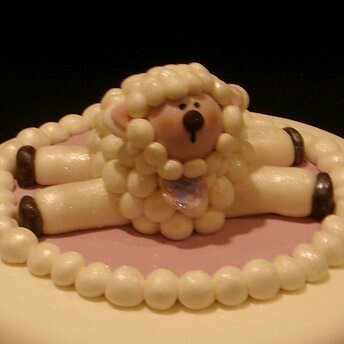 The momma-to-be requested a lamb theme to align with the shower theme, so I decided to do a handmade little lamb figurine topping the cake. The cake itself was a new recipe: lemon cake with both lemon buttercream and blackberry fillings. I iced with tinted vanilla fondant. The little lamb is fondant and is painted with some edible glitter dust to give it the sheen. Baby Shower - Planes & Elephants! This was a really exciting project for me… A friend of mine asked me to do two cakes for a friend’s baby shower… each with a unique theme. 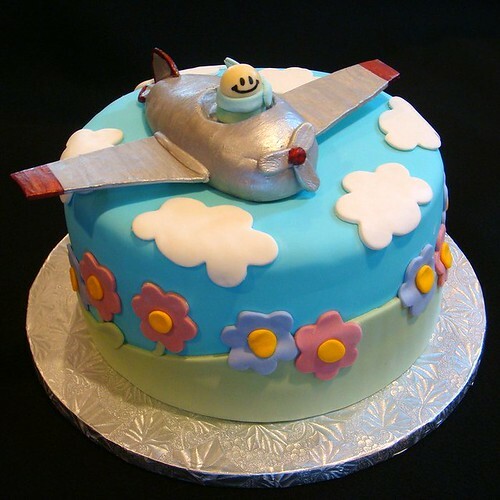 Cake #1 was to be airplane-inspired to honor the pilots in the celebrant’s family (chocolate cake with dark chocolate buttercream & vanilla fondant). 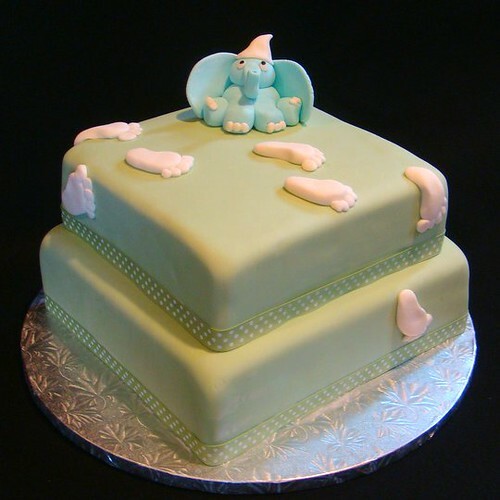 Cake #2 was to reflect the shower invitation with little baby feet and a sentimental baby elephant (white cake with vanilla buttercream & vanilla fondant). All of the figures are hand-made/hand-painted fondant! This cake was my second fondant cake - it was for my office’s Thanksgiving potluck party. 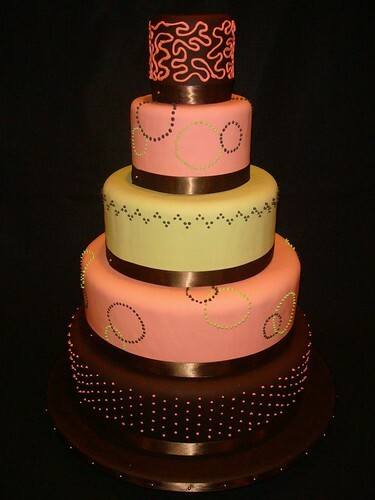 This one is chocolate cake with cream cheese filling. 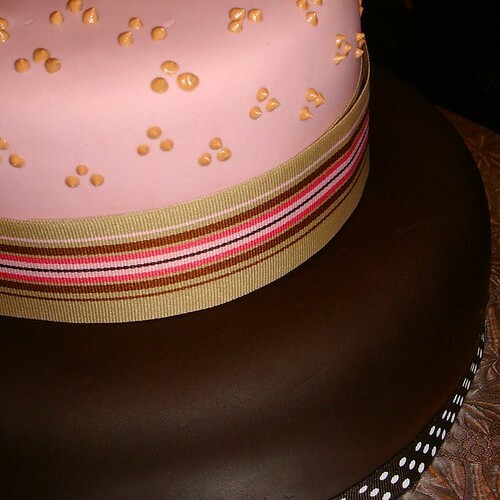 It’s covered in chocolate and vanilla fondant, with some ribbon and buttercream detailing.